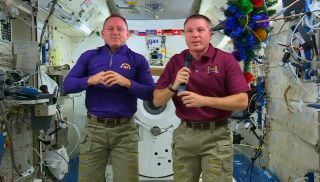 NASA astronauts Barry "Butch" Wlimore (left) and Terry Virts discuss Christmas plans aboard the International Space Station during an interview on Dec. 22, 2014. While many of us here on Earth are opening presents and feasting on Christmas Day (Dec. 25), astronauts aboard the International Space Station will be having their own celebration high above the planet's surface. The two Americans among the six-person crew of the current Expedition 42 — commander Barry "Butch" Wilmore and flight engineer Terry Virts — are getting a break to mark the holiday in space, NASA officials said. "They'll have the day off, spend time together enjoying their time off, looking out the window and generally taking it easy," NASA spokesman Joshua Buck told Space.com. Wilmore and Virts recorded a Christmas video message wishing everyone on Earth a Merry Christmas. It's clear from the video that the space station is decked out with lights, Santa hats, Christmas stockings for each crewmember and even a tiny Christmas tree. "Butch got stockings for us all, and I've got some presents, so I think we're going to have a little gift exchange and eat some irradiated turkey, dehydrated mashed potatoes and cornbread dressing," Virts told Baltimore's WBAL radio during an in-flight interview on Dec. 22. "So it should be a good Christmas Day. And actually, we'll get to celebrate it 16 times, because we get 16 sunrises every day here." The plan also called for a Christmas Eve service aboard the orbiting lab, Virts said. Wilmore, Serova and Samoukutyaev will return to Earth in March 2015. They will be replaced by the next three crewmembers, part of a rotating system that keeps the International Space Station manned at all times.